One of the first department stores in the country, it was built in functionalist style in the 1930s. The main façade, reaching five storeys high, is more or less one gigantic window. It was the first building in Prague to have escalators installed. 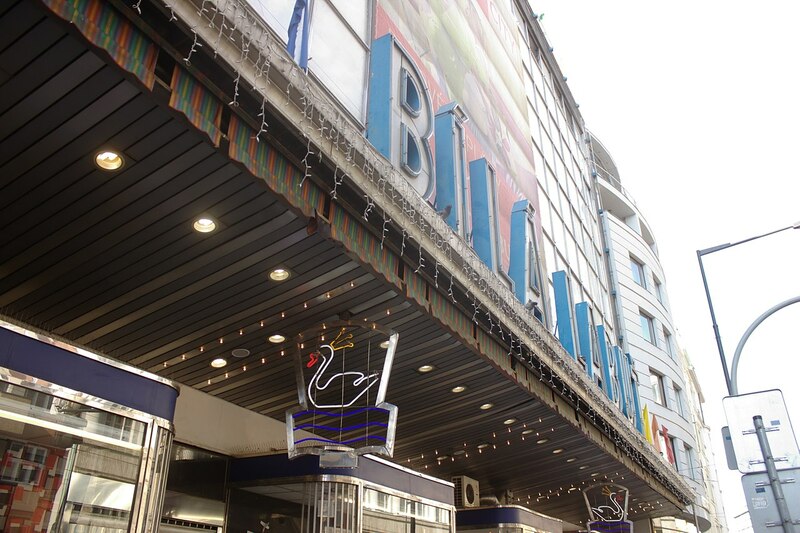 Bílá labuť has continuously been a department store since it opened. One of the first department stores in the Czech Republic was built in the functionalist style in late 1930s. The main five-floor facade is actually one huge window with an area of ​​30 x 18 m, for which 180 sheets of opaque heat and sound insulating glass were used. Internal layout and construction of facilities were ahead of its time. Bílá labuť (The White Swan) was the first building in Prague to have an escalator. In place of the renowned department store, there used to be a one-storey house with a coaching inn and a brewery. Once it was called U Podušků. Over time, the house was decorated with an emblem of a white swan, and so people started to call it At the White Swan. The inn was prosperous, as an old busy trading path was near. Behind the house, there was a great garden, in which a wooden pavilion was built later on; there were sheds and stables for the carters’ horses. The house was also renowned for its cabaret and café, with music and dancing after the performance. Among the performers, there was a cabaret company Volf and Škoda, or the „folk singers“ Sodoma and Šmíd. Šmíd was the founder of the “swan” cafe, which moved to Ostrovní Street in the 1880s, yet the cabaret theatre Labuť remained here until the 1930s. In 1910, a cinema of Invalids was established within the yard. When the facility began to decline, a popular Prague businessman Jaroslav Brouk bought it to establish a modern department store. The newly established joint-stock company opened an architectural competition, which was won by ing. arch. Josef Kittrich and ing. arch. Josef Hrubý. The old one-storey house was demolished in the summer of 1937, and within 25 months, a new glass palace grew here with a ferro-concrete skeleton in a Functionalist style. It covered 70,000m3 of space, the palace was 70 metres deep, with the greatest width of 44m. The main facade was in a height of five storeys actually a single enormous window with surface area of 30 x 18m, for which 180 plates of non-transparent, silver-gray glass, insulating thermally and acoustically. At the time it was the greatest glass-covered space in central Europe. 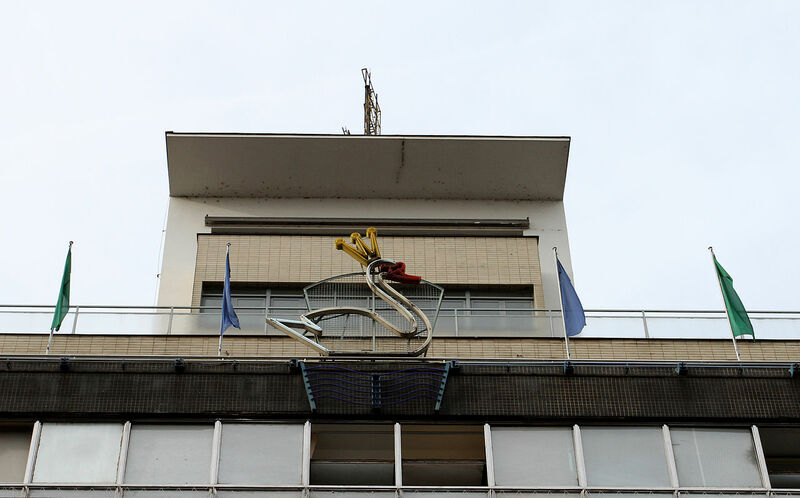 Above the sixth floor for administration, there were three more storeys within a tower superstructure with a terrace, back then open for public, where an eight-metre revolving neon swan was installed according to a design of graphic designer Božidar Leiser. Three storeys below, there was a smaller terrace for the employees, who could spend their lunch break there on deck-chairs under the parasols in summer. There were 11 floors in the object altogether, with 2 floors underground. The entrance hall of shop windows was remarkable, as they covered 600m2. The entire business palace was heated via modern heating Crittall system conducted via ceilings; modern methods of ventilation and lighting were used, and there was a slip facility for waste. Interior furnishings were designed by academic architect Jan Gillar. There were 5 large passenger lifts installed in the interior, each for 10 persons, a fright lift, and an escalator from the ground floor to the first floor, the first one in Prague to be installed within an interior. Naturally, there were also two fixed staircases. For the first time in Europe, a Prague company installed a pneumatic pipe cash register here, which connected all the sales departments with the central cash register. The place was very friendly to the customers. On each floor, there were numerous comfortable resting places, the care takers in the children’s corners with a paradise of toys looked after the small children while their parents were shopping, and there was a luggage and prams depository available, etc. The object was called the „Poříčí Miracle“. Department store White Swan was opened in the tragic atmosphere of the starting occupation of the republic on the 19th March 1939. As late as in the end of the 1960s, ing. arch. Josef Hrubý designed an ancillary building with social background for the White Swan employees in Biskupská Street, and he also suggested some necessary modifications in the department store, which was greatly overloaded and worn-out due to heavy traffic. 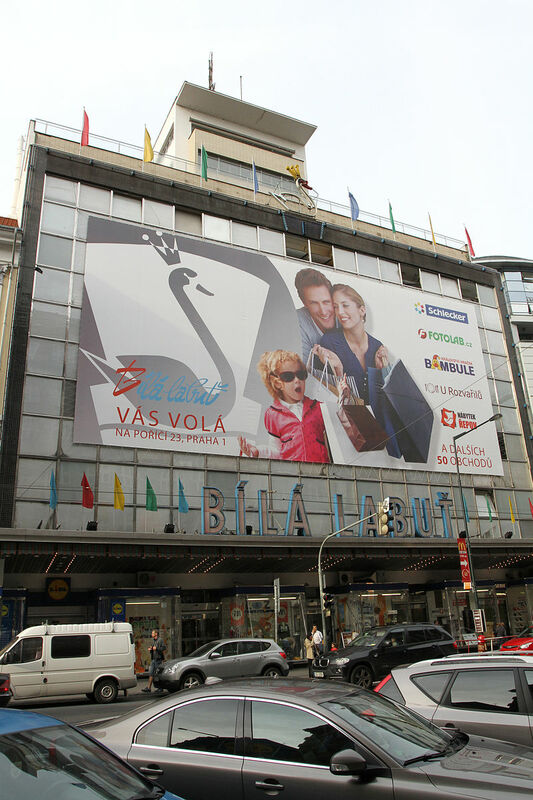 Until 1975, when the department store Kotva was opened, followed by Máj, the White Swan remained the only full-assortment department store in Prague. In the 90s, the ancillary building in Biskupská Street was restored and a modern hotel named White Swan was established here.